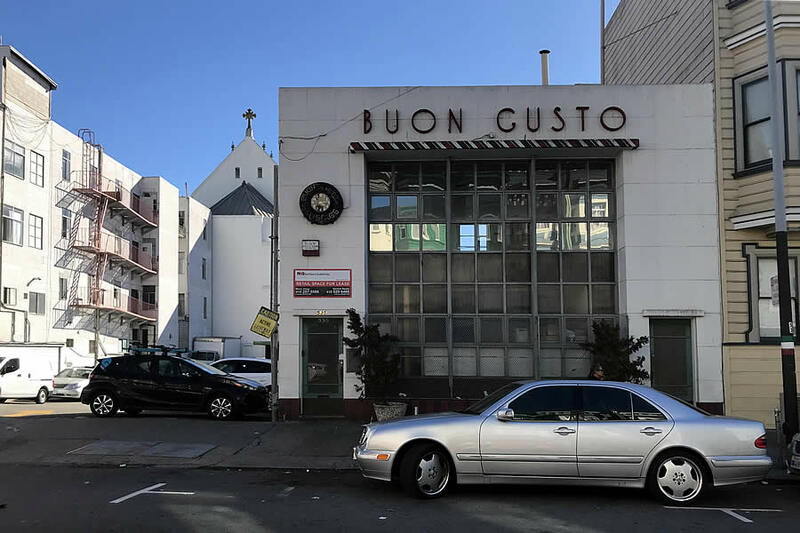 Built in 1948, the shuttered Buon Gusto Sausage Factory at 535 Green Street was once the largest sausage and salami producing facility in the west. 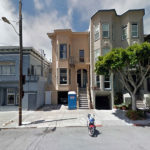 The 8,600-square-foot building, which is in need of work and includes a 4,000-square-foot basement, sits on an 11,000-square-foot lot in the middle of North Beach. 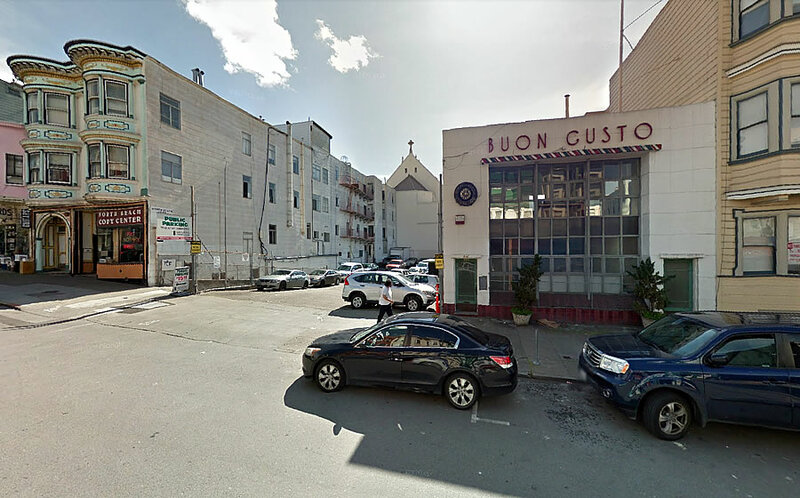 While the building has been identified as a potential historic resource, its parcel, which includes the adjacent parking lot, is zoned for development up to 40 feet in height, with housing allowed above the ground floor. Plans to redevelop the site have since been drafted. 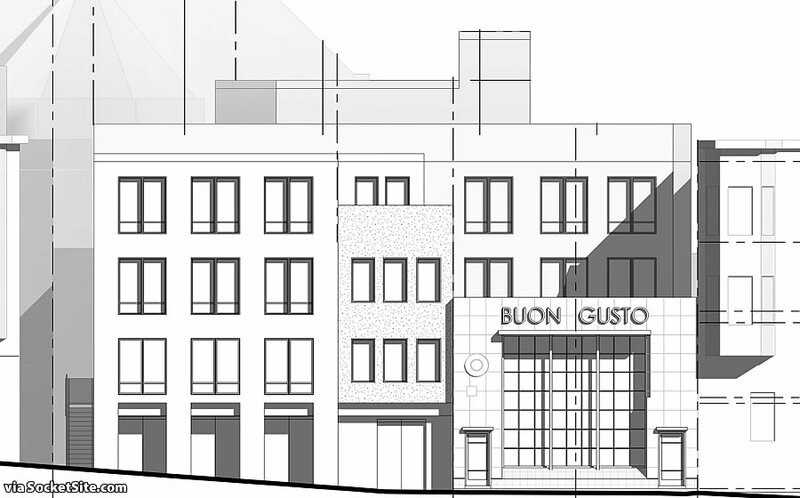 And as envisioned, a 4-story building would rise up to 40-feet in height across the site while preserving the façade of the historic Buon Gusto building, with 24 residential units over 6,500 square feet of new ground floor commercial space and a storage room for 21 bikes. …Or none of it. Just not this pointless in-between. A sausage factory from 1948 is cool not “historic”. Just keep the sign, the rest is worthless. This is definitely an example of SF’s laws going too far. That building maybe old, but it is not worth saving. And you’ll be fighting with Aaron Peskin and his THD friends for a decade before you break ground… And that price is insane for unentitled land. $289k/door!? I think the preservation effort is a natural response to some of the bland architecture we see throughout the city. I don’t know if anytime in my lifetime, walking down the sidewalk of 4th St through Mission Bay will ever be as “fun” as walking down the streets of North Beach. Maybe I’m wrong, and the “Mission Bay look”, will be cooler than the classic SF Victorian look, but I’ll settle to say that preserving the facade is a decent compromise when given the expense of retrofitting whole building vs “Mission Bay look” architecture. And is this plan, in fact, a response to laws that “have gone too far” ?? If so, which ones … the article only mentioned that it was “identified as a potential historic resource”. Perhaps the development team actually wanted to preserve the building (or part of it); I realize you seem to think such people are crazy – and probably shouldn’t be allowed near power tools – but the world is better for a little craziness … at least of this type. Ive never seen this in person, but I think it will preserve & fit into the new project quite nice. I like this. My office is nearby and it is aesthetically striking when you see it and lends a ton of character to the neighborhood. It’s not like some of the garages that seem to be randomly preserved as historic. I’m glad the developers are considering keeping it. 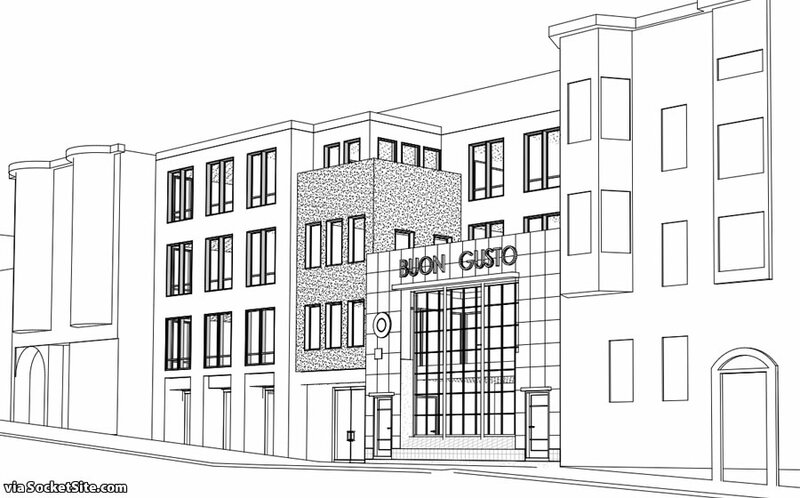 The deco font used for “BUON GUSTO” is a huge part of the original facade’s charm. Interesting how in the elevation it vanishes, replaced with an utterly pedestrian one. I think that’s probably a simple reflection of their CAD software not having a font match, rather than any plan to replace the signage. Perhaps a graphic artist can tell us if this appears to be a commonly used design, though with only seven different letters – and really only the “S” standing out – it may be difficult to distinguish a commercial design from something bespoke. Totally agree. I was thinking that a software limitation was the likeliest explanation. Odd to me that this elegant circa 1930 font ended up being chosen in the late ’40s over the (slicker, duller) moderne ones then popular.